Tonight we’re eating grilled turkey burgers stuffed with caraway havarti, applewood smoked bacon, and chopped parsley. The burger was served on a grilled onion bun and dressed with mache, sauteed cabbage deglazed with red wine vinegar, and a dijon vinaigrette. For a healthy alternative to the standard french fry we had grilled broccoli tossed with a lemon vinaigrette. A: mmm. burgers are my weakness. man, i’m so american. T: Carnitas are my weakness. I’m so mexican. A: heheh 😛 i share a weakness for carnitas, but i’m just never around them. burgers, on the other hand, i can find everywhere! and make easily! T: If all burgers were more like the stuffed burgers you make, I’d be much more passionate about them. I love getting a couple of bites into a patty and having cheese and other goodies burst out. Mmm. These burgers tonight were a great example of that. Melted cheese and bacon is a good thing to find in the middle of a burger patty. Especially when it’s a turkey burger, which I’m afraid might get a little dry without the goods in the middle. A: true dat. in my demented mind, i think that turkey burgers are great to fill with all the heavy things like cheese and bacon. you’re saving yourself some cholesterol by using turkey so you can add the other goods without feeling too bad…. plus, when their stuffed and properly seasoned, i really don’t think there’s much flavor difference between it and beef. T: no, not too much of a difference. Beef burgers are more moist (aka greasy), and to a certain extent they taste better because of that. But a good stuffed turkey burger is hard to beat. A: so what did you think of the sauteed red cabbage as a topping? weird or good? T: I thought it was great. It went really well with the rest of the burger… and the bun. Not to mention it was gorgeous and refreshingly different. A: agreed. but not so different that it made me want the burger dressed differently. you know, i still shudder at the thought of pickled beets on burgers! i know i shouldn’t make the assumption that it’s nasty without trying it, but i just don’t know. beets are so…. sweet! T: I have not come to term with beets yet. I’ve only had em a couple of times, though… maybe there’s still a chance of liking em. Well, what do you rate the meal tonight? A: i’m gonna give it a 4.25/5. it was quite tasty. I particularly like the grilled broccoli. it was crisp and smokey. not something i’ve eaten a lot of, but i dug it. you? T: I give it a 4.4/5. It was good, although not up to the level of some of your other stuffed burgers. The cabbage was nice and tangy… very tasty. The broccoli… good but not my fave. I really like the taste of roasted broccoli… but the grilled broccoli tasted a little too grilly for me. A: yeah, it was definitely grilly… but i tend to like grilly. just add a smokey flavor to damn near anything and i’m happy. hmmmm… except maybe ice cream… or cake. especially if it’s that nasty liquid smoke flavoring. that would be pretty nasty. Add the crumbled bacon, shredded havarti, and chopped parsley to a bowl. Mix to combine. Set aside. In a separate mixing bowl add the ground turkey, worchestershire, and a pinch of kosher salt and freshly cracked black pepper. Mix gently just until the worchestershire has been worked in. Try not to over mix the meat, this will lead to a tougher burger. Separate the seasoned meat into three equal portions. Take one portion of the meat in your hand. Flatten the meat out into a patty and pressing into the center of the patty to form a dip. Place 1/3 of the cheese/bacon mixture into the dip in the patty. Work the edges around the stuffing up and over until the stuffing is completely encased in turkey. Try to work it into a flattened patty, avoiding a meatball-esque burger. Repeat this process two more times with the rest of the meat and fillings. Season the outside of the stuffed burgers lightly with salt and pepper. Grill the burgers over direct medium-high heat for about 4-5 minutes per side or until the patty is just cooked through. Allow the burgers to rest for a couple minutes before diving in. 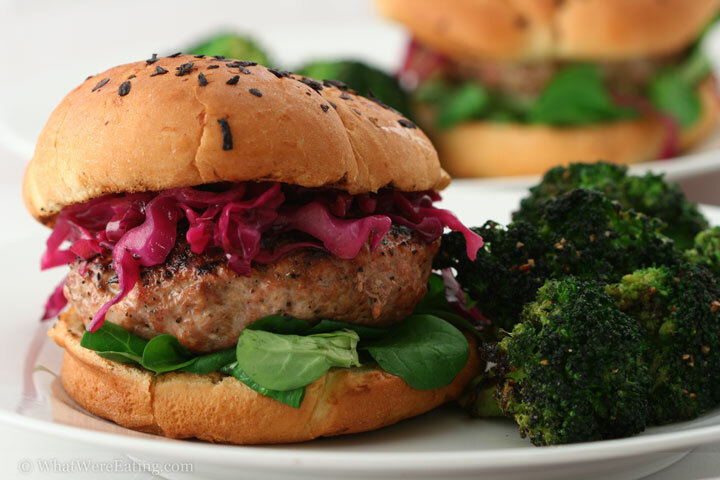 These burgers are great topped with sauteed red cabbage, mache, and dijon vinaigrette (recipes follow). Enjoy! Preheat a frying pan over medium to medium-high heat. Add the bacon drippings to the pan. Once the pan is hot add the shredded red cabbage. Toss the cabbage around in the pan to cover with oil. Saute the cabbage until it begins to wilt and get tender, stirring frequently, about 5-10 minutes. Once the cabbage has started to wilt, add the caraway seeds then stir. Allow the cabbage to cook for about one more minute after you've added the caraway seeds, giving the seeds time to toast and release their oils. Next, deglaze the pan with the red wine vinegar, making sure to scrape up all the yummy bits that may have collected on the bottom. Once most of the red wine vinegar cooks away, after about a minute or two, season the cabbage with kosher salt and freshly cracked black pepper. Taste the cabbage. If the seasoning levels need to be adjusted, do so until properly seasoned to your own tastes. Serve hot. This cabbage is great as a side dish but also goes great as a topping for a burger or a hot dog. Enjoy! Add the dijon and red wine vinegar to a mixing bowl. Whisk until smooth. While continuously whisking slowly drizzle in the olive oil in a small stream until all the oil has been added and you are left with an emulsified vinaigrette. Season with salt and pepper to taste. Enjoy! Add the lemon juice and zest, dijon, and honey to a mixing bowl. Whisk until thoroughly blended. While whisking constantly, drizzle in the oil in a slow stream to form a emulsified vinaigrette. In a large ziplock bag or mixing bowl toss together the broccoli and the vinaigrette. Let the broccoli marinate for at least five minutes before grilling. After the broccoli has marinated, season with kosher salt and freshly cracked black pepper. Grill over indirect heat for about ten minutes, or until the broccoli is tender yet still crisp and beginning to show some good grill marks. Enjoy! omg i think chris would pass out if i made stuffed burgers! sounds awesome, i must try it one day. you make the best stuffed stuff amanda i’m a huge fan of carnitas too, ohhhhyeah!! Wow, you guys are totally on a roll! You have been cooking up a storm! Do you think you might be interested in adopting an East coast grad student? I am an excellent chopper. Thanks Nicole! i just got a new job a couple of months ago and we’re finally starting to get back to normal! hopefully the roll will last for a while! So Liquid Smoke IS gross, then? I was considering making beef jerky with it, but I’ve heard too many differing opinions. That burger looks gorgeous, by the way, almost enough to make me consider making a turkey burger. It could be a tofu burger and still be wonderful if you stuff it with bacon adn cheese! (Don’t quite me on that tofu stuff…) And I dunno, smokey ice cream might be alright… just add bacon and cheese.